Results of the indoor shoot held Tuesday and Thursday January 29 & 31. Tuesday: beginners, cubs, juniors and seniors. 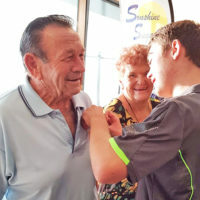 Scores out of 200 (15m): Lachlan Gough 172 (Junior Sighted), Wayne Revell 168 (Senior Sighted), Warren Hutchinson 163 (Senior Traditional Recurve), Ian Revell 157 (Senior Sighted), Toby Revell 155 (Junior Sighted), Ethan McDonough 130 (Junior Traditional Recurve). Thursday: seniors, juniors and cubs. Scores out of 300 (15m): Gordon Kelly 229 (Senior Bare Bow), Merv Kerrison 218 (Senior Sighted Recurve), Alan Wilson 203 (Senior Traditional Recurve), Vern Kackey 185 (Senior Sighted), Warren Hutchinson 170 (Senior Traditional Recurve), Jeff Thompson 169 (Senior Traditional Recurve), Phil Adams 129 (Senior Traditional Recurve), Aaron Redhead 72 (Senior Bare Bow Beginner). Next outdoor shoot: (paper) Sunday February 17 at Bawden’s Bridge course; 10am start with sausage sandwiches and drinks available. Indoor archery: At 21 Turf Street Grafton; the river side of the railway line, via Fitzroy Street. Tuesday: From 6pm – beginners, cubs, juniors, and seniors. Thursday: From 6pm – seniors, juniors, cubs and anyone else who would like to come along.